Over the years I’ve tried to keep up with the endless fishing tech that comes out season after season. New fish finders new cameras new ice fishing sonar graph units. Some of this equipment getting bigger and bigger like big screen TV looking screens on some of the Bass boats and etc. It’s ridiculous to say the least some of, not much of this stuff is simply not necessary! Don’t get me wrong here Fishing tech is important, but if you need a huge Lowrance or Humminbird in the Console and at the Bow and one on the stern you need Help! Believe me when I say as an experienced angler time and room in the boat are paramount. I can’t be bothered wasting time punching buttons on fish finders. My Lowrance I use in the Console of my rig is used to get me on a location and then I am fishing, not looking at the finder much at all. I check it once in a while for depth reference water temp etc. For me room to fish is most important, I hate being cramped in a boat. I like to move around shoot and scoot reading the lake with my eyes, yeah I know it’s an old school approach, but I never go home skunked and always keep the fish busy! My rule of thumb now when it comes to new fishing tech is simple, can it be used on multiple mobile platforms and does it function on both Apple and Android app platforms? Most important is it portable? Can it be used on and off shore and on ice? Will it allow me to capture and mark GPS locations and save data for reference later? And IS IT WIRELESS? I am sick and tired in this wireless world we live in being stuck to wired stationary units that cost a fortune and are obsolete in a year, like those huge expensive Fish finders. My favorite new piece of fishing tech is my Wireless Deeper Fishfinder. I started using it back in Nov/Dec 2015. It can be used on Samsung Phones or Tablets, I use it on both. It is also supported on Apple iPhone and iPad and functions via Bluetooth. The App is free safe and works perfectly it’s always up to date. It’s a remarkable unit one I have field tested the living hell out of both Ice Fishing and in the boat, I’ve also cast it out into the middle of the Athabasca and Pembina Rivers many times it’s a durable piece of equipment. It’s always provided accurate and quality information and has never once let me down. I think my favorite application for the Deeper is Ice Fishing, it has an extraordinary Ice Fishing sonar application. Very accurate and sensitive, the high quality of the graphics are in many cases better than the expensive stand alone Ice Fishing sonars out there. One of the things I love most is how easy it is to set up and use no wasted time, when you power it on and it starts running your fishing immediately. Ice fishing mode is easy to use and gives you a decided advantage on the ice, the warning of the presence of fish closing in on your bait is exceptional. The Deeper also provides exact weather details for the location you are fishing, moon phases all the info you need at your fingertips. The integrated calendar is also a plus to load trips and go back and review other dates you fished. The history function tracks every second of Time your Deeper is in action, giving you a chance to go back and review specific times in the day you fished a highlight reel so to say. During the Summer, I can run the Deeper from my boat or from shore just cast it out into the river or lake and you are in business no matter what you do Deeper will come with you and perform like no other. I can also run it in double screen mode showing the graph and the mapping showing the exact location I am on the lake giving me the option to mark locations via GPS. It does everything the big units do and more. When I’m done the Deeper packs away in a small pouch and I go back to using my Tablet and Phone for other things it’s Simple, Fast, Smart! I’ve moved past all the big name wired products, the future of Fishing tech is wireless so don’t go too crazy on the expensive brand name fishing electronics they will try and sell you until they go wireless. No need to get bogged down with wired gear that’s going to be obsolete soon. Look for Wireless equipment look for Deeper! I will be posting more and doing some video The Deeper is a product I 100% Recommend. 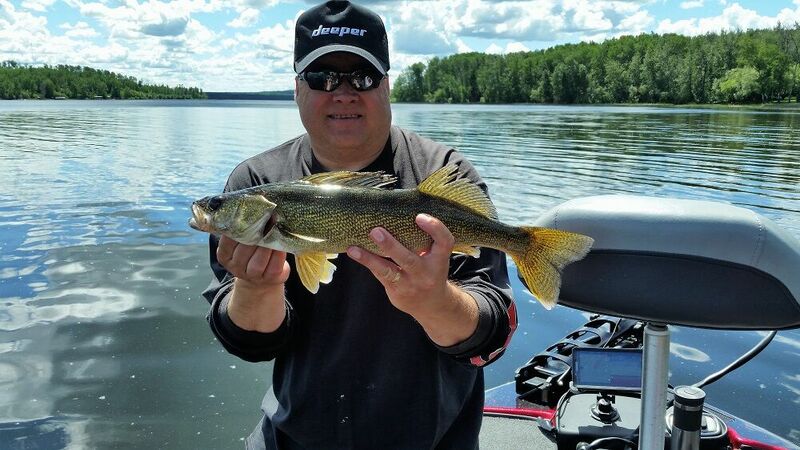 Gary C Love from GCL Fishing is a professional angler from Athabasca, Alberta Canada, with more than 35 years of experience. Find out more about Gary here.